"IF IT WASN'T FOR MY HORSE, I WOULDN'T HAVE SPENT THAT YEAR IN COLLEGE." Welcome to Interstellar Space Sounds Premiere Issue. We hope to expand as we progress, and one day take over the world. The stuff on here will come from a variety of sources: some I'll write myself, some will be written by friends, etc. Sign my guestbook at the bottom of the screen or send e-mail to let me know what you think (or to contribute articles or ideas). I'll be updating frequently, so check back often! 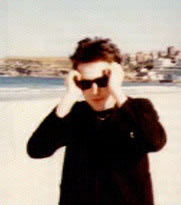 The Cure's Robert Smith - standing on a beach. Ironic, no?